Inksupply.com R2880 CFS system offers professional quality ink tones with our MIS Ink K4 bulk ink set. This ink set offers advanced color gamut's which will insure the highest quality color reproductions for brilliant reds, blues and purples. The InkSupply.com CFS system will also house auto resetting chips. Once these chips reach below the 10% level on your ink status monitor simply reseat the cartridge to reset it back to full. It is recommended that the R2880 CFS be used with either a Photo Black (PK) or Eboni Matte Black (K) this selection is based soelely on the preferred finish on media that is being used to create your prints. For glossy media the Photo Black should be selected to insure proper adhesion to a high and semi gloss finishes. Eboni on the other hand will be used for matte media, our Eboni black will create the deepest blacks on matte papers without over saturation. A third option is available, which is known as out Universal Black or MK for short. This ink is to be used if one is switching between glossy and matte media in daily print jobs. However this flexibility does come at a price, which is paid through the permanence of the ink. Where our PK and K offer an archival 100 year fade resistance, the MK will only offer a 20 year fade resistance in a portfolio type setting. 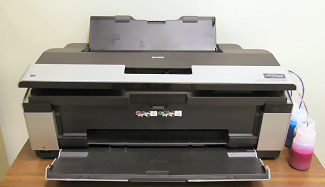 If this type of ink needed we recommend the selection of our CFS-R2880-PK system, this system will contain a Photo Black chip which will display the most paper options within the printer driver.